“Harvey” will open the series on November 19. The 1950 comedy-drama, based on the play by Mary Chases, stars Josephine Hull, Peggy Dow and Charles Drake, alongside Stewart. 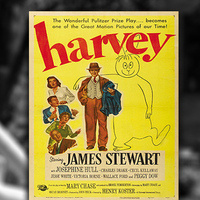 Elwood P. Dowd (Stewart) is a middle-aged man whose best friend is an invisible 6-foot-tall rabbit named Harvey. Due to her desire to have a normal life and marry her daughter off, Elwood’s sister, Veta Louise Simmons (Hull), attempts to have Elwood put in a mental institution. However, after a mix-up occurs, Veta finds herself committed to the institution instead, leaving Elwood and “Harvey” to straighten out the mess. The film received two Academy Award nominations, winning one for Best Supporting Actress.